England football manager Gareth Southgate has been named an Honorary Yorkshireman. 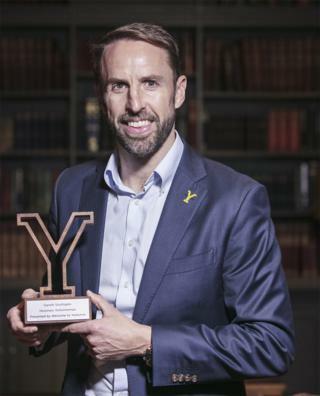 Watford-born Southgate was given the accolade at the White Rose tourism awards. Organisers said the award was for "inspirational individuals who have made a big impact on Yorkshire, despite being born outside the county lines". Southgate has lived in Harrogate since 2001, when he moved to the spa town while playing for Middlesbrough. The 48-year-old led the national side to their most successful World Cup campaign since 1990, with the team reaching the semi-finals in Russia. Take That star Gary Barlow and musician Tim Firth, were both awarded the accolade in 2015 for their contribution to Yorkshire culture with Calendar Girls: The Musical. Southgate said he was "proud and very honoured" to be given the title. "I've lived here longer than I've lived in any other part of the country," he said. "The values and friendliness of the people has been incredible. "We love living here and have thoroughly embraced the Yorkshire way of life. It's nice to be recognised in this way, I'm very proud."